This post contains affiliate links. I may receive a commission, at no cost to you, when you choose to use the links provided. See the Disclosure Policy for more information. 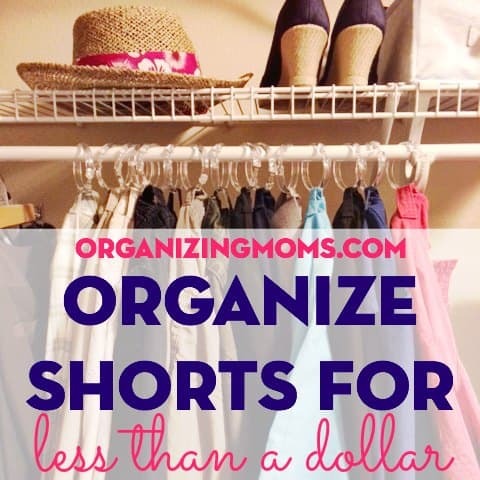 Do you have trouble finding the right pair of shorts when they’re stored in a drawer? For me, storing shorts in drawers has always been messy. I end up digging around through the drawer to find the shorts I want to wear, and the shorts end up getting wrinkled. I solved this problem by doing a simple organization with shower curtain rings project. This is one of my favorite organizing ideas I’ve implemented in our closet this year. I got rid of a lot of the clothes that don’t fit me anymore, so I ended up with extra space to hang clothes in my closet. I decided to use shower rings to organize my shorts after I’d seen the idea posted on several other organizing websites. 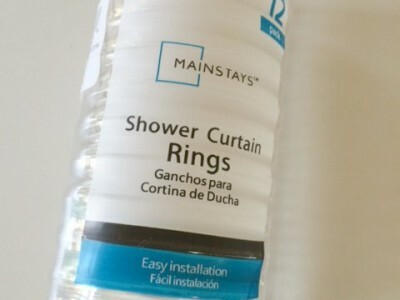 I bought these shower curtain rings at Wal-Mart for under a dollar. I had fourteen pairs of shorts I wanted to hang up, so I ended up buying two packages of shower curtain rings for the organization project. If you have twelve or fewer pairs of shorts, you’d only need to purchase one package. I hung all of the shower curtain rings with the opening facing the same way to make it easier to hang the shorts quickly. No more folding shorts. This wasn’t a huge deal, but it’s nice to not have to fold some things! Fewer wrinkles. Because I’m not smashing the shorts into drawers, they don’t get as wrinkled, and there aren’t any crease marks from where I’ve folded them. It’s easy to see everything. I always know what’s clean, and what’s available. 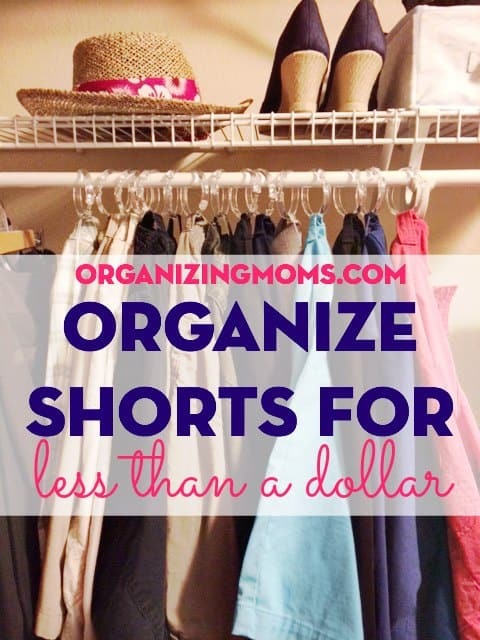 When I kept shorts in a drawer, I’d forget about some of my favorite shorts because they were pushed to the back of the drawer. Hang the shower curtain rings on the bottom of a hanger, and then hang your shorts from the shower curtain rings. 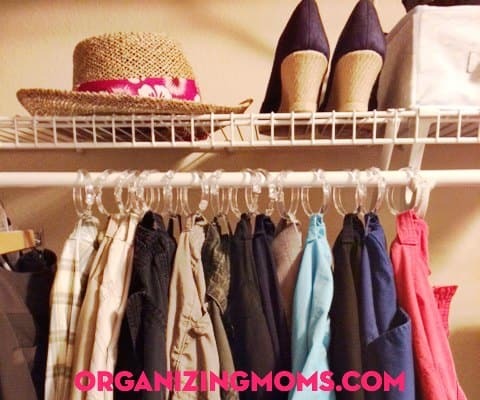 This is good if you are low on space and have at least one or two sturdy clothes hangers. Use the shower rings to hang jeans. 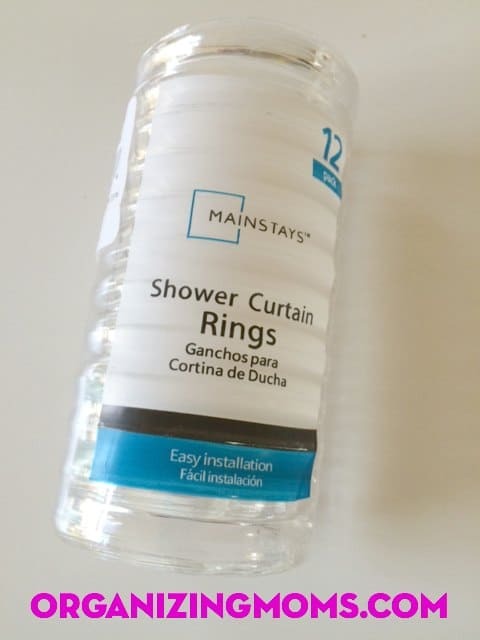 I’m not sure if these shower curtain rings would be strong enough to hold a pair of jeans, but I might test it out with the leftover shower curtain rings I still have. New to this community? Start here, friend! 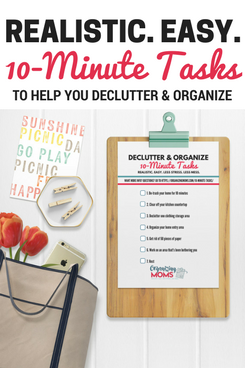 Obsessed with simple, easy home management. Mom to twins. Founder of Organizing Moms.